The Communist Party of Revolutionary Marxist (CPRM), usually a bitter critic of Gokha Janmukti Morcha(GJM), has welcomed the latter’s initiative in organizing the two days seminar on creation of a Gorkhaland state which was attended by important speakers from Delhi. 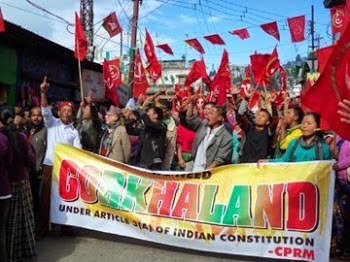 CPRM, too, supports the idea of Gorkhaland, and has often criticized GJM and its predecessor Gorkha National Liberation Front of compromising with the West Bengal government in their anxiety to form the hill council. On Wednesday, after a central committee meeting to discuss GJM’s seminar on Gorkhaland, CPRM spokesperson Govind Chhetri said: “We welcome and congratulate GJM on having organized the seminar which was attended by speakers from various political parties with influence in Delhi. It will certainly give impetus to our statehood demand”. Speakers such as Subramanian Swamy from the BJP and Keshav Rao, the Telangana Rastriya Samity TRS MP from Telengana, voiced their support in favour of creating a Gorkhaland state in the two-day event organized by the Study Forum, GJM’s intellectual wing. CPRM pointed to the common stress made by the speakers from Delhi to unite and struggle for statehood in peaceful and democratic way. “Most of the speakers have advocated for joint struggle with participation of political opponents. Pro-statehood parties in the hills are in majority and also leaders from other states have promised to extend support. GJM being the largest party here and an ally of the BJP must take initiative to reach out to others,” Chhetri said. Significantly, CPRM underscored the stress placed by speakers at the seminar on the need to unite and struggle for statehood in a peaceful and democratic way. “Most of the speakers have advocated for joint struggle with participation of political opponents. Pro-statehood parties in the hills are in majority and also leaders from other states have promised to extend support. GJM being the largest party here and an ally of the BJP must take initiative to reach out to others,” Chhetri said. However, CPRM also set conditions for a joint struggle for separate state. “We will join hands with GJM to make the statehood demand stronger but will only do so without compromising. We want the GJM to let go of the Gorkhaland Territorial Administration (GTA) to build pressure on the government to make think of other options,” Chettri said. “One cannot sit in a government chair and at the same time agitate against it,” he pointed out. “Just see the example of how Uttarakhand and Telangana were created. They did not consent to any alternative arrangements including its leaders accepting government posts,” said the CPRM spokesperson. His obvious reference was to GJM president Bimal Gurung, the GTA chief executive, a post which he had given up in the second phase of the agitation post-2007 and again accepted, later.